For more than a year, it’s been the happy trend across the nation for the average DOM (days on market) for residential properties to have been declining. It’s a “speed of sale” measure—one that most Utah County home sellers hope will reflect that it won’t be long before they are handing the keys to happy new owners. 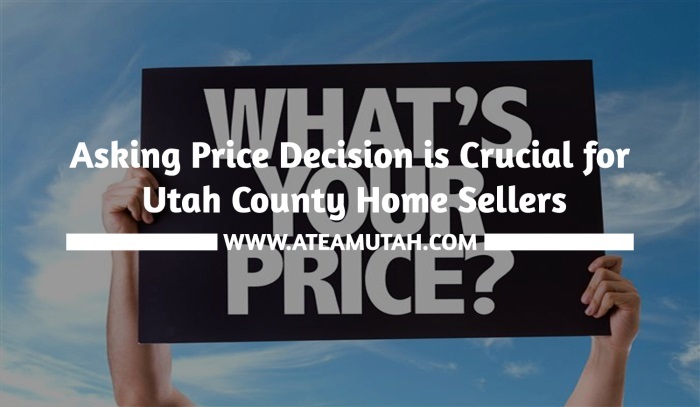 There are some ruling considerations that go into establishing a winning Utah County asking price. One is psychological: thinking of a buyer’s frame of mind, most people don’t want to be the only ones who are interested in a house. When a slightly lower-than-comparable asking price is part of the marketing message, it draws a crowd. Another consideration is the search bracket. Knowing how buyers tend to bracket price range parameters for similar Utah County homes is something I can help with. If comparable homes have been selling in a range that tops out at $400,000, asking $410,000 (so you can discount it in later negotiations) is a mistake: your property won’t even appear on search results you’re aiming for. Sometimes that truism can seem indisputable. If the property in question has been listed at an asking price that’s higher than comparable Utah County houses—other homes that have sold—unless outside factors have slowed all area sales, the asking price is probably the stumbling block. A homeowner can quite reasonably object that their property has unusual qualities that make direct comparisons with other Utah County homes inexact, but that logic may not be powerful enough to counter the market figures that buyers can see (remember that they don’t want to be the only ones who are interested). Sometimes even for a home that shows spectacularly, lowering the asking price can be the simplest and quickest route to a “sold” sign on the front lawn. In the case of those Utah County homes where Utah County asking price conformity isn’t the issue—as when there simply are no other properties that are at all similar—if lowering the asking price is not indicated, it will simply become a waiting game: waiting for the buyer who appreciates the special character of the property. The good news is that there IS a buyer out there for every property; the bad news is that unique properties attract unique buyers—as in, there are fewer of them. But there is some second good news: when they do show up, they are apt to fall in love with the place! Pricing is part math and part skill, and since the market is constantly changing, it’s a skill that rewards experience tempered by consistent monitoring. I monitor Utah County real estate full time so I can provide the most timely assistance and advice in all phases of selling and buying. I hope you’ll give me a call!